The new vintages of Jolie-Laide Trousseau Gris and Pinot Gris are in. Buy now from our online shop. Where to begin… wines like this one are the reason I started a wine business. This particular wine has preternaturally brought me both new friends and tons of website traffic (“Jolie-Laide Trousseau Gris” is the #2 search term that brings people here, second only to “Winelandia”). The ache I feel deep in my soul when enjoying a glass of this beautiful wine is not one of pain, but one of longing – for things to come, for the evolution of wine in California, for the joyfulness of new and exciting experiences, for the hope of new wines that might move me in the way that this one has. At it’s root, wine is happiness, and I struggle with the enormity of the bliss I feel when I savor this wine. The first time I had the Jolie-Laide Trousseau Gris, it was the 2011 vintage, and I was sitting at the bar of the now defunct Punchdown wine bar in Oakland with Colleen. At the time, we were a little confused by this Trousseau Gris that spent some time on the skins, and weren’t quite sure what to make of it. I’d only had Trousseau Gris as a varietal wine a few times before, from Wind Gap, whose rendition was an inexpensive, simple, quaffable, bright, and fresh summertime wine. I went on to find the 2012 Jolie-Laide Trousseau Gris a year later, which had less color but still had tons of spice and texture. I was floored by it, so taken by it’s beauty and grace that I wrote this blog post about it. So what is Trousseau Gris? It’s a “gris” or grey grape, a mutation from the red Trousseau variety originally from the mountainous regions in France. Pinot Noir can mutate in the same way, creating Pinot Gris. It’s not uncommon for wine grapes to mutate into different colors, although some varieties are more prone than others. Anyhow, when Trousseau Gris is picked and pressed immediately after harvest, it produces a light straw-colored, bright, fresh, and fruity wine. Jolie-Laide’s version sees 5 days of skin contact during a pre-fermentation “cold soak”, where it extracts color, texture, phenols, spice, and loads of complexity. Jolie-Laide is a one-man operation based in a Sebastopol winery. The winemaker, Scott Schultz, is an assistant winemaker at Wind Gap, and makes only 500 cases of wine a year under his own label. Jolie-Laide translates literally to “Pretty-Ugly”, a French term of endearment to describe something that is unconventionally beautiful. Scott’s wines are very true to their name, though there is nothing ugly about them. 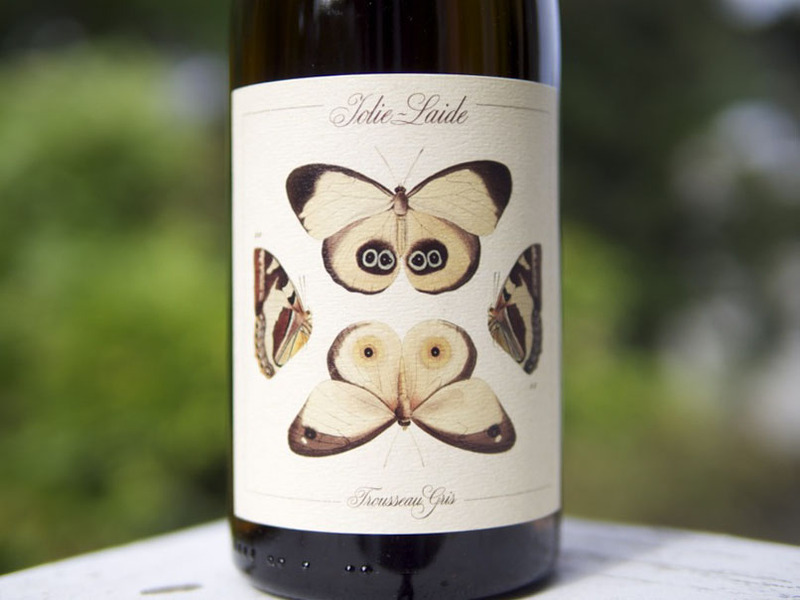 I picked up a couple of cases of the latest vintage, the Jolie-Laide 2013 Trousseau Gris. Wines like this don’t come around every day, so get some before it’s gone. Bio: Instead of a bio, I’ll tell you the story of how I came to know Scott. It was about 2 years ago, and I was up at the old Wind Gap tasting room with some friends. Scott, assistant winemaker at Wind Gap, also made his own wine in the same facility, and he was the one pouring the Wind Gap wines that day. We chatted a bit about wine-making and the business, and afterwards it seemed like I’d run into him every time I was at an industry event. It turns out Scott makes some of the most unique and highly sought-after wines in California, in minuscule quantities of course. This is his fourth vintage, and one we are very excited to offer to our customers. Production: A five day whole cluster cold soak on the skins gives this wine a beautiful peach-colored hue, texture, spice and weight. The wine underwent a spontaneous two week fermentation at cool temperatures, which preserved the intense aroma of the wine. Aged in neutral wood, no malo, and bottled in early March. Tasting Notes: Sweet summer peach and honeysuckle intertwine with plushness and spice on the palate to produce an entirely unique wine, completely different from the last vintage, while still being true to the Trousseau Gris. An adventure in a glass. Food Pairing: The only thing this wine needs is a big tulip shaped glass, abundant sunshine, and you.